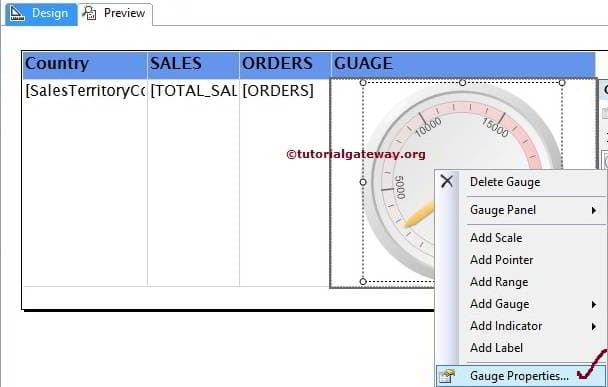 In this article, we will show you, How to Change the Gauge colour, Gauge Frame, Gauge Pointers and formatting Range properties in SQL Server Reporting Services with an example. To explain the available Format options, We are going to use below shown report. 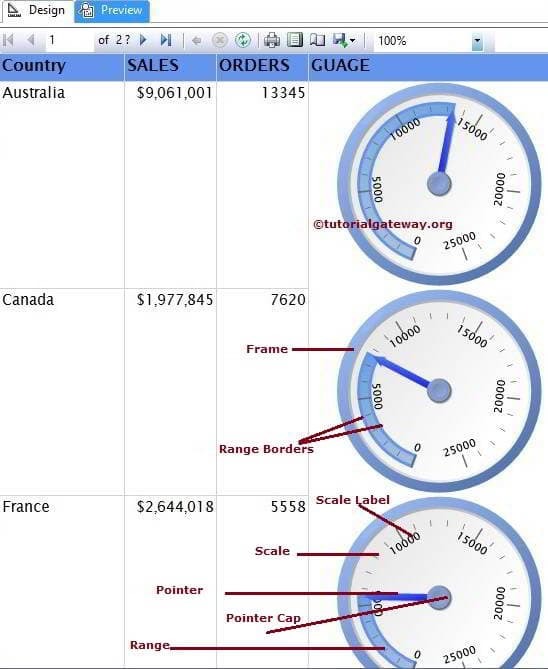 Please refer Gauges in SSRS article to understand the Data Source and Dataset we used for this report. 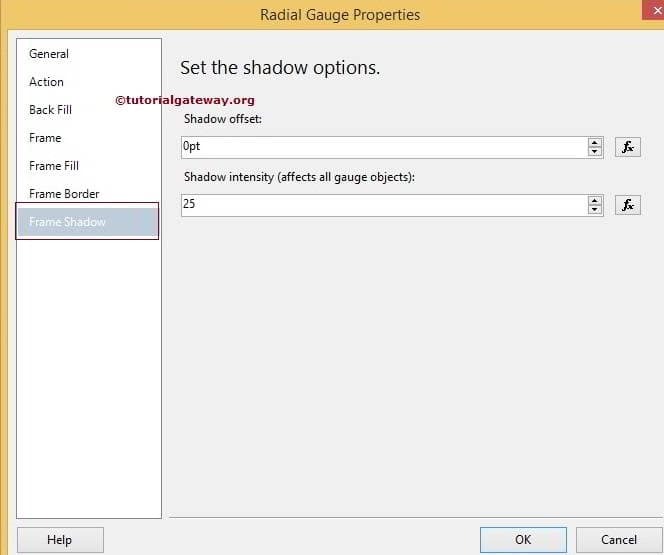 Once you click the Gauge Properties.. option, a new window will be opened to format the Radial Gauges. From the below screenshot you can observe that, By default, Gauge is filled with White Smoke color but For now, we selected the white color. 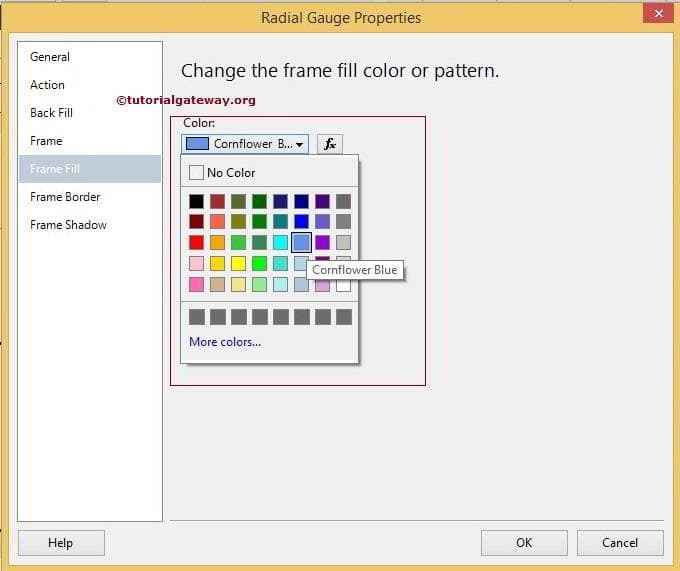 Please click on the fx button to write the custom expression for color. 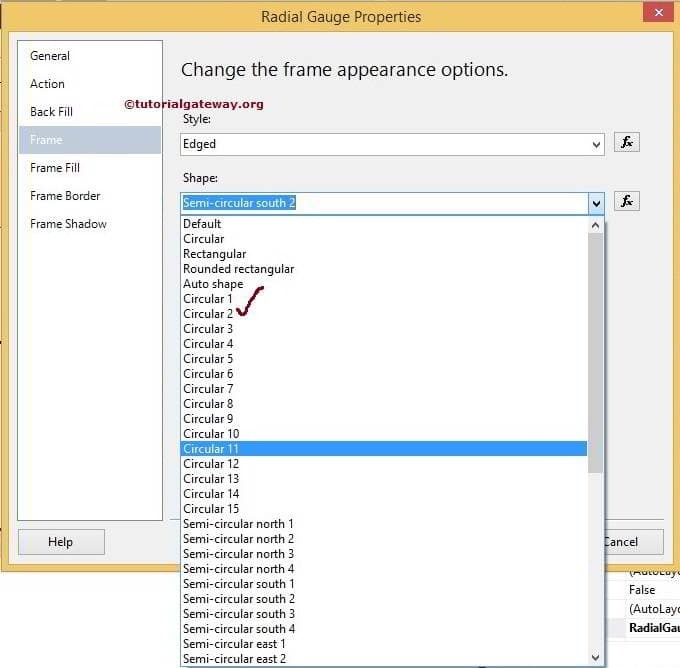 Within the Radial Gauge Properties window, If you click on the Frame Tab we have multiple shapes to choose as shown below. Here we stick to the default Circular 2 but you try your own. If you click on the Frame Fill Tab we have the default Frame color, Please change as per your requirement. Here we are selecting Cornflower Blue color as Frame Color. 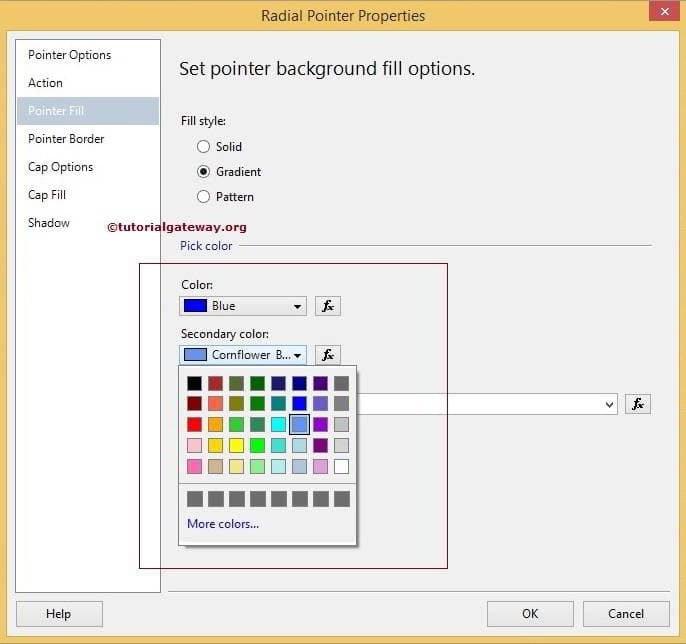 Within the Radial Pointer Properties tab, If you click on the Pointer Fill Tab we have the default pointer color and Style, Please change as per your requirement. Here we are selecting a Primary color to Blue and Secondary color to Cornflower Blue color as shown below. 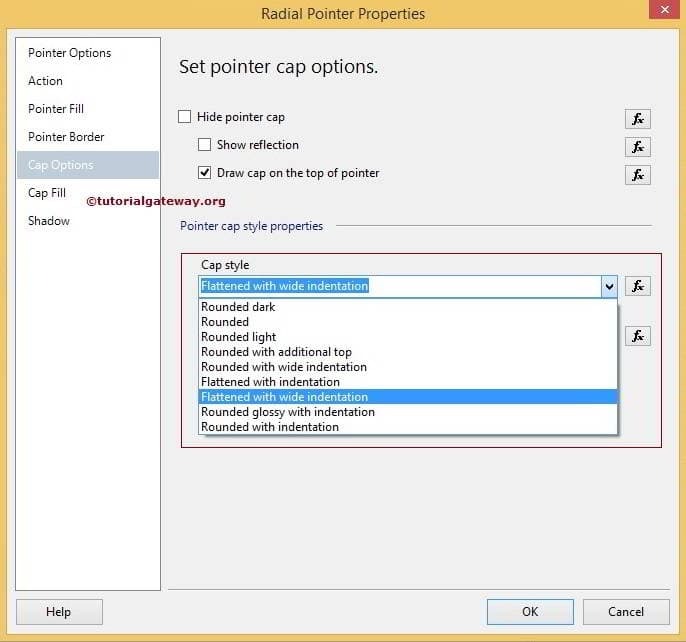 Within the Radial Pointer Properties tab, If you click on the Cap Options Tab we have the options to Hide the Pointer Cap and change the default Cap Style, Please change as per your requirement. 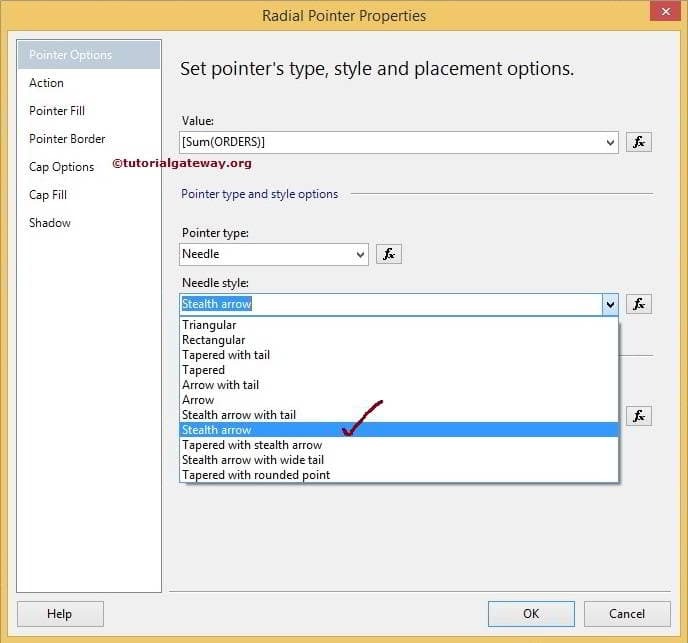 Here we are selecting Flattened with wide indentation as the Pointer Cap Style as shown below. 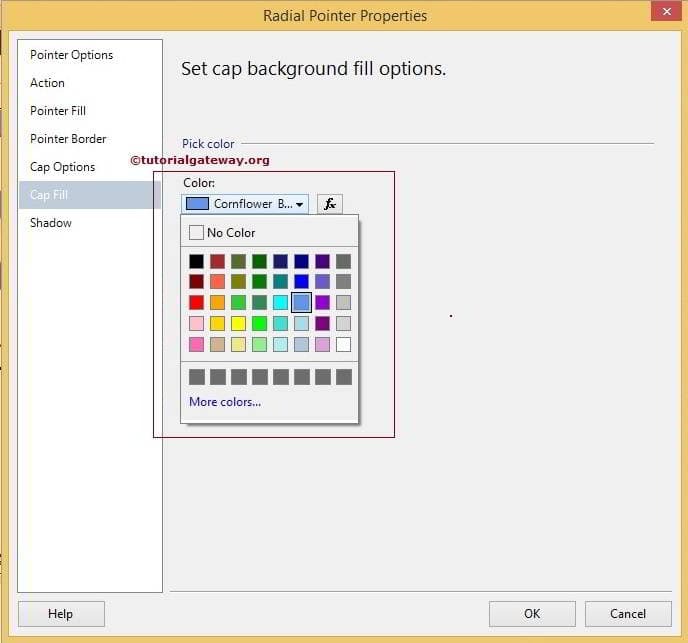 Within the Radial Pointer Properties tab, If you click on the Cap Fill Tab we have the default cap color, Please change as per your requirement. Here we are selecting Cornflower Blue color as shown below. 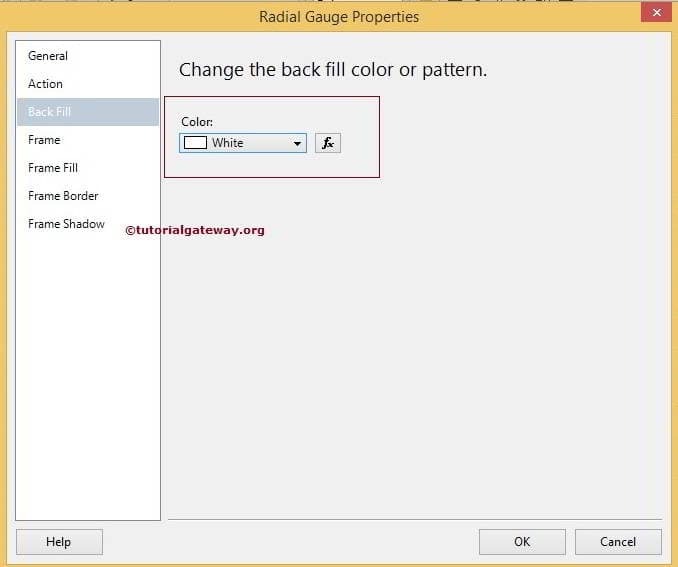 Once you click the Range Properties.. option, a new window will be opened to format the Range of a Radial Gauge. 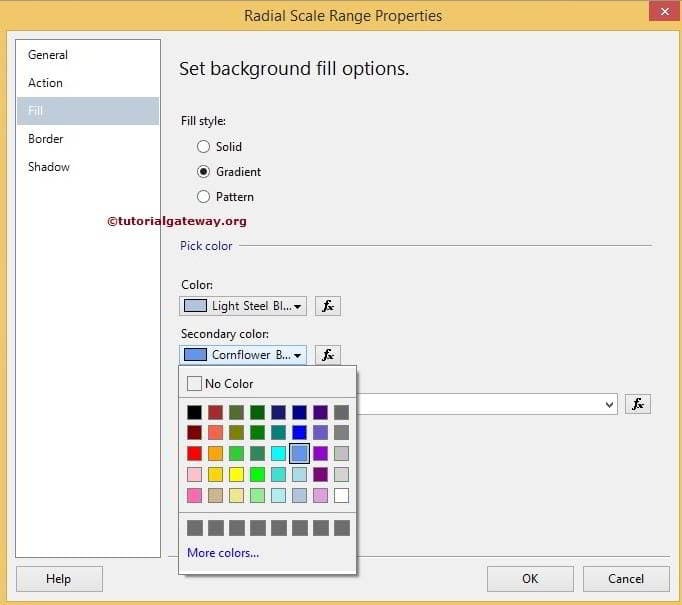 First, goto Fill tab, you can notice the default colors and styles of a Range, Please change as per your requirement. Here we are selecting a Primary color as Light Steel Blue and Secondary color to Cornflower Blue color as shown below screenshot. 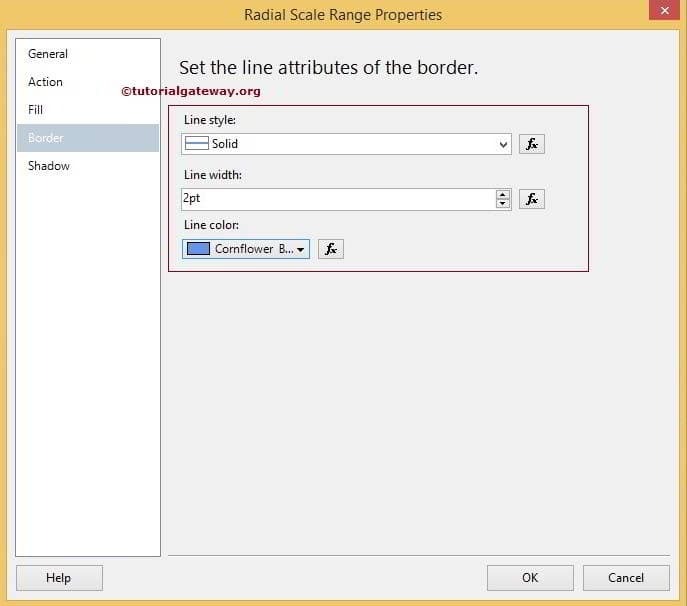 Within the Radial Pointer Properties tab, If you click on the Border Tab we have the default Line Style, Line Width and Line Color. Here we are selecting Cornflower Blue color as Line Color, Width as 2pt shown below. 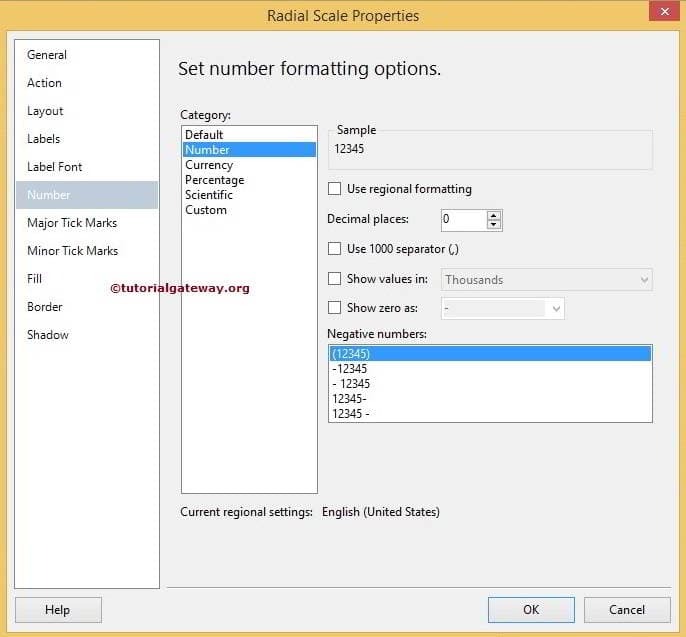 First, Right-click on the Scale will open the context menu as shown in below screenshot. 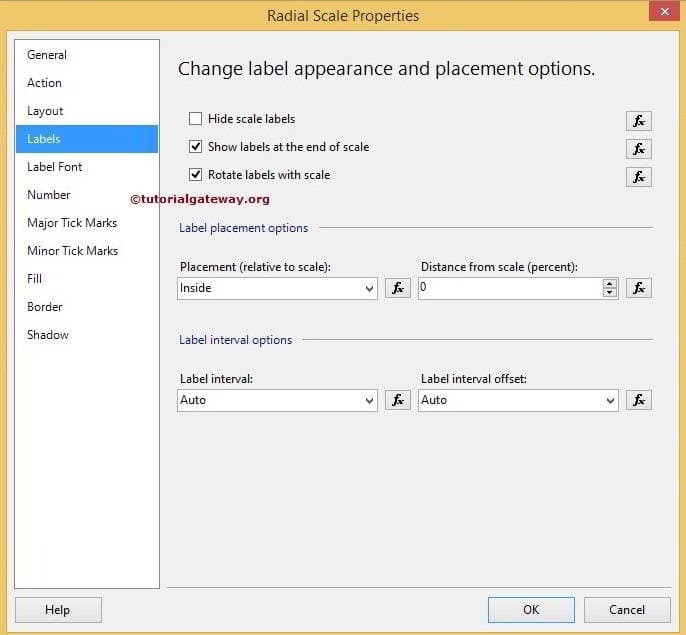 Please select the Scale Properties.. option from that menu. 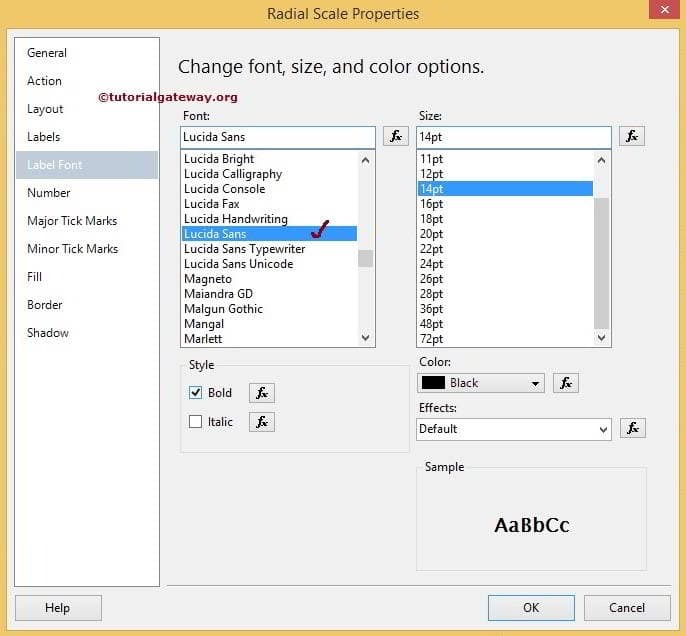 Once you click the Scale Properties.. option, a new window will be opened to format the Scale of a Radial Gauge. First, goto Labels tab, you can notice the default configurations of a labels. 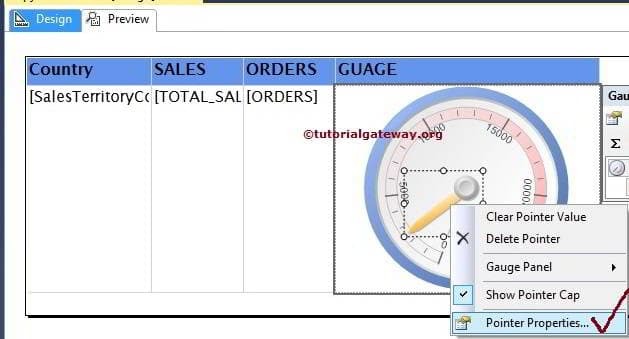 Here you can Hide or Show the labels and also change the positions etc as shown below screenshot. 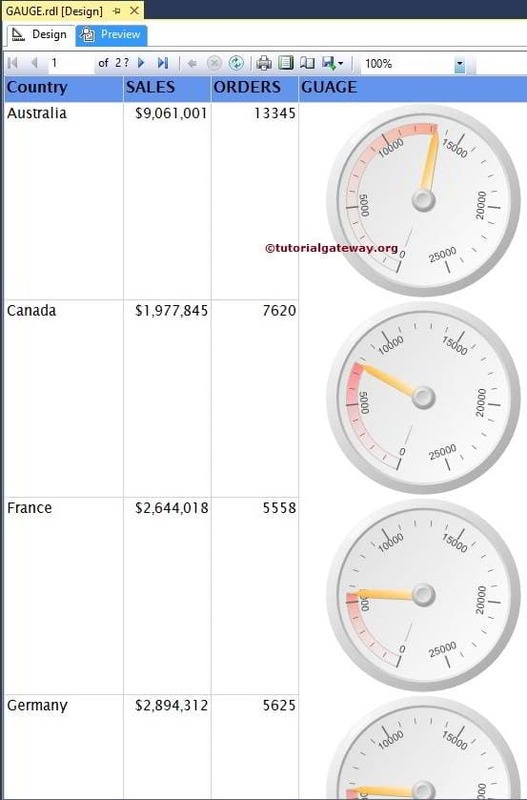 Within the Numbers Tab, you can change the Number format to Number or Currency or Percentage. In this example, we are removing extra decimals.